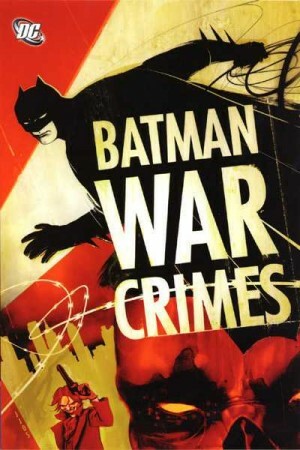 The prevalence of criminal gangs in Gotham over the years has consistently proved beyond Batman’s control, with new gang leaders emerging every time he rid Gotham of their predecessors, so in War Drums he concocted an ambitious scheme to deal with the problem once and for all. 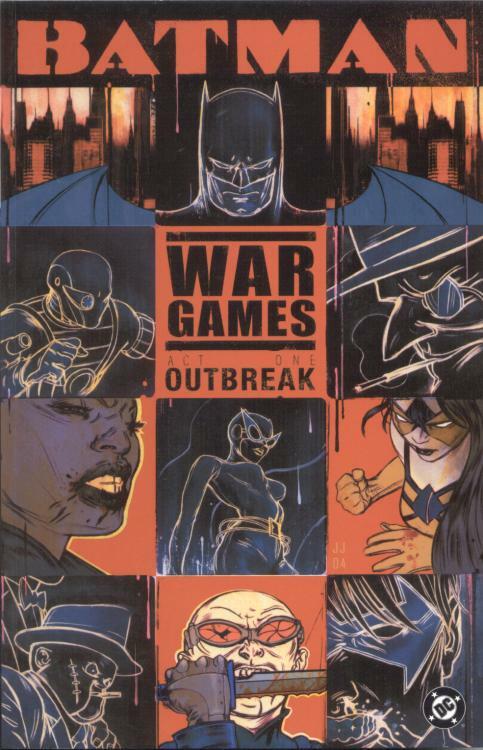 This led to War Games, a saga that occupied all Batman related titles for three months at the end of 2004. 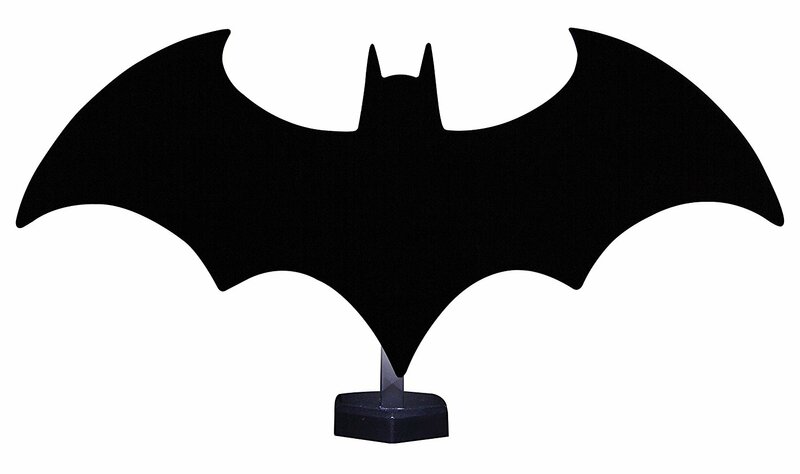 It opens with Spoiler, whose hopes of becoming Robin after Tim Drake vacated the position have been, well, spoiled by Batman. Instead she’s returned to her former identity and is seen watching a meeting of all Gotham’s gang leaders dissolve into a puddle of mistrust, bullets and blood. 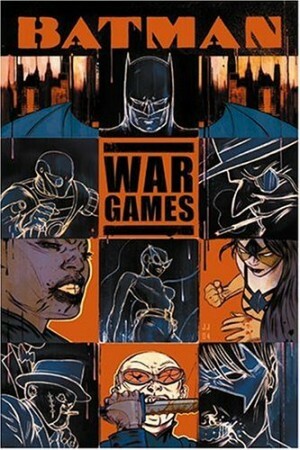 The puzzle for Batman becomes to deduce who arranged the meeting, and who benefits from deaths of several gang leaders. Much of the remainder of the book entails one gang perceiving another as weak and setting about them. 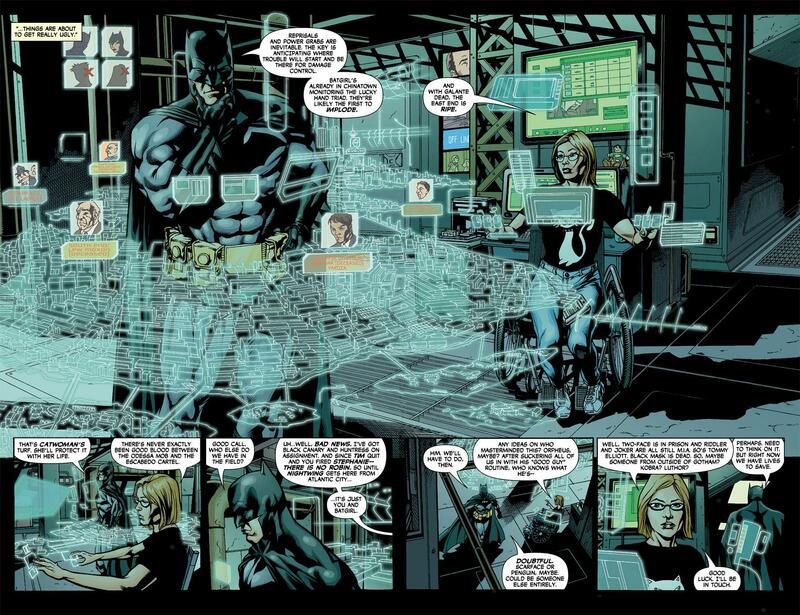 Batman has several operatives, one undercover, but is unable to be in enough places simultaneously to prevent continued bloodshed. 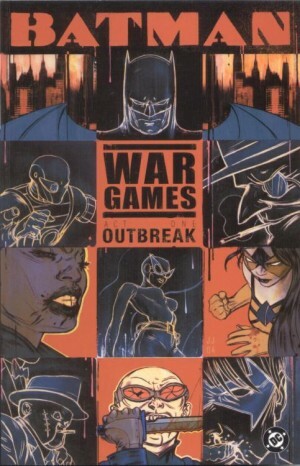 Considering this crossover involves the creative teams involved with eight different ongoing comics, War Games is a surprisingly smooth read as it progresses from spotlighting one title hero to the next. The segues are well foreshadowed, and no-one really lets the side down. It appears to be luck of the draw that some creative teams are more involved in the overall plotting than others, but that’s no great drawback. The atrocities escalate in a desperate and convincing manner, and if one chapter stands out it’s the Robin segment by Bill Willingham and Giuseppe Camuncoli. 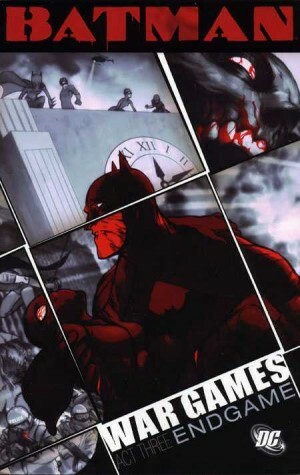 A key plot point is Tim Drake’s promise to his father that he’ll stop being Robin, so what does he do when his girlfriend, a gangster’s daughter, comes under attack? Willingham’s solution is novel and thrilling. There are a few minor setbacks, one being that there’s an inconsistency between the way the cast without masks are depicted. Dr Leslie Thompkins runs an emergency medical clinic in Gotham and becomes increasingly important (spotlighted well in the Catwoman segment), yet vacillates between the middle-aged woman she’s generally seen as to the super-glamourous woman seen in Mike Lilly’s otherwise sound pages. That’s a comment that applies to most of the nine artists involved. The sample art is a particularly well designed piece from Pete Woods, but the work of many others could equally be spotlighted. 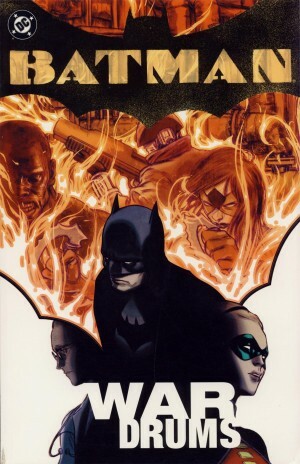 By the end of the book the person responsible for the gang war has been revealed, but Batman and allies are no nearer to ending it as more lives are continually lost. The mayhem escalates further in Act Two: Tides. 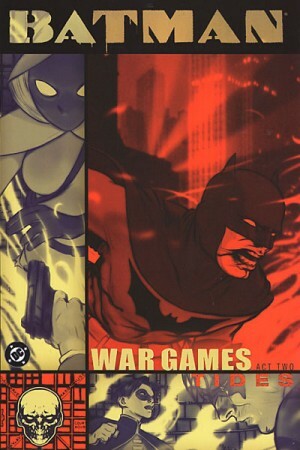 Alternatively, the entire saga has more recently been reissued as two bulkier paperbacks, and this can be found in War Games Book One.